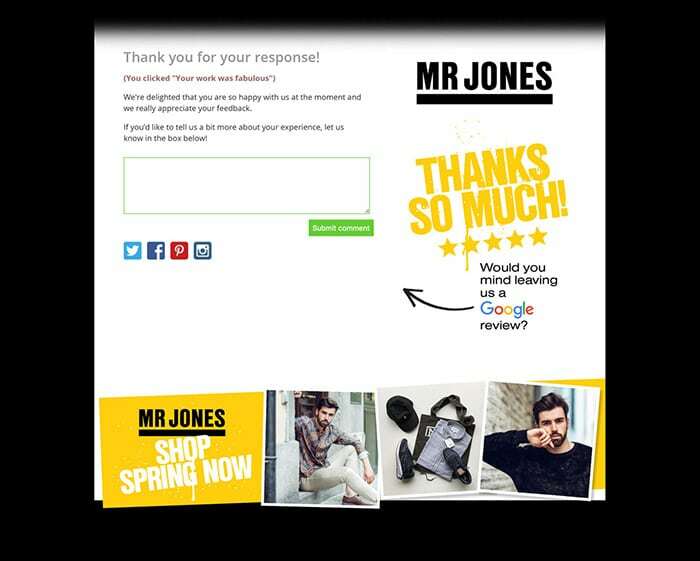 Did you like being sent a Customer Thermometer survey? 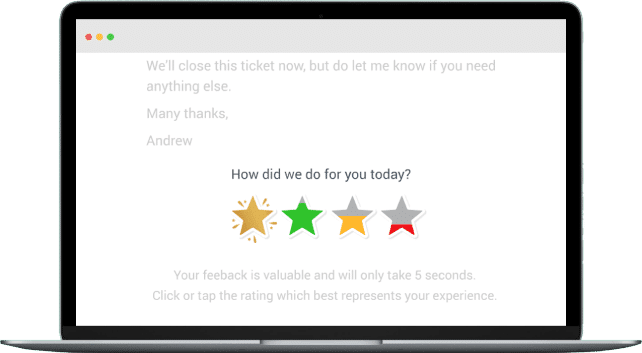 Feedback in just one click. Friction-free surveys. Get feedback on how you’re doing from emails you already send. You liked this approach. Your customers will too. Get an account and 10 surveys free. Embed our buttons into your favorite applications. 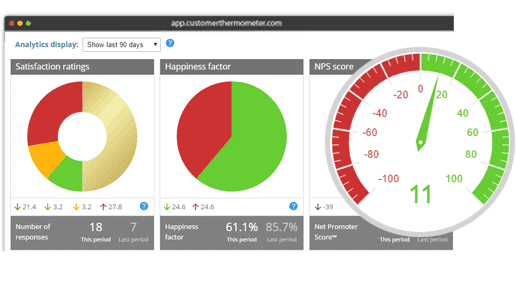 Once your Thermometer template is set up, connecting our buttons with your helpdesk, ITSM, marketing automation or CRM app is a breeze. We generate the HTML snippet to paste into your application – you can customize it too. Simply add it to the relevant email template(s) of your app and trigger emails as part of workflows. We are the “Click here for our survey, it’ll only take 5 mins?” replacement. Because that technique doesn’t work. Add Thermometers to your email signatures by inserting our buttons and attaching your unique links. 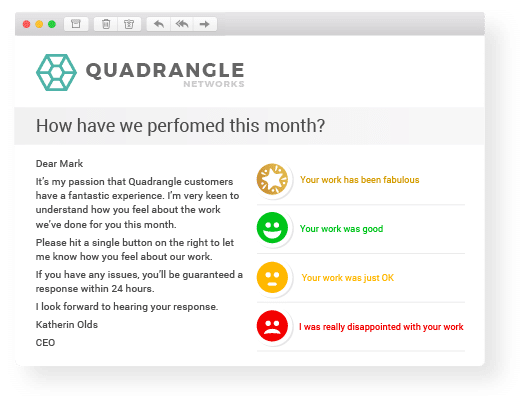 Whether you use Outlook or Gmail (or any other form of email client) our feedback buttons can give you continuous insight into how your customers are feeling. Get you and your team set up in minutes. 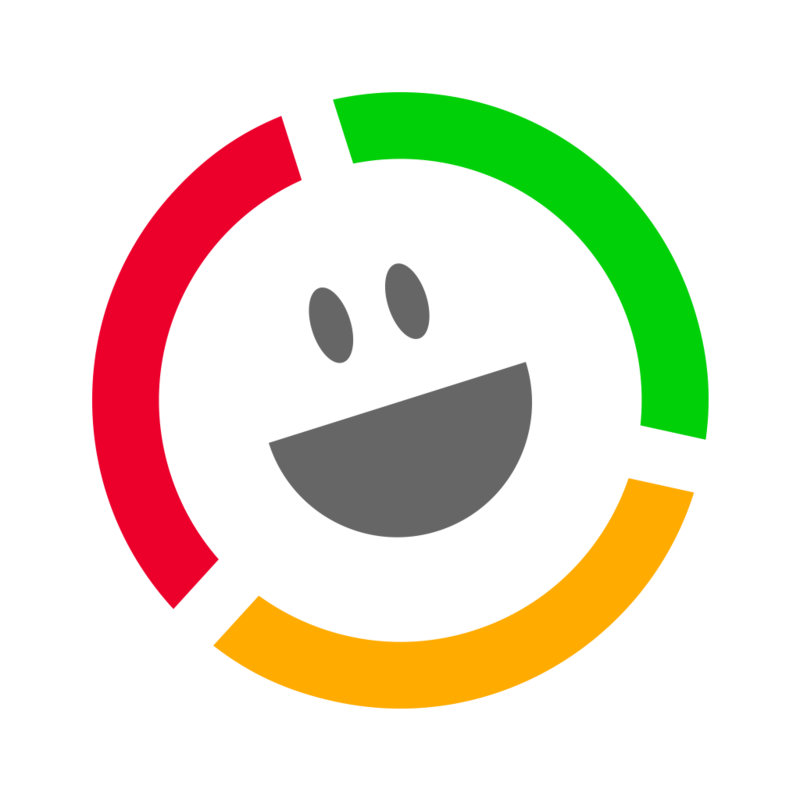 Give each team member a unique signature and track how they are doing. We can also integrate with most leading Signature Management tools. Customize your email template, then upload your contact data. We then send your 1-click emails and collect your results. To give you a head start, there are templates preloaded in your account. If you can use Word, you can send an Email Thermometer. We reckon it takes most new users 5 minutes to get the hang of it. Use all three methods, or just one. Setup and send couldn’t be simpler. 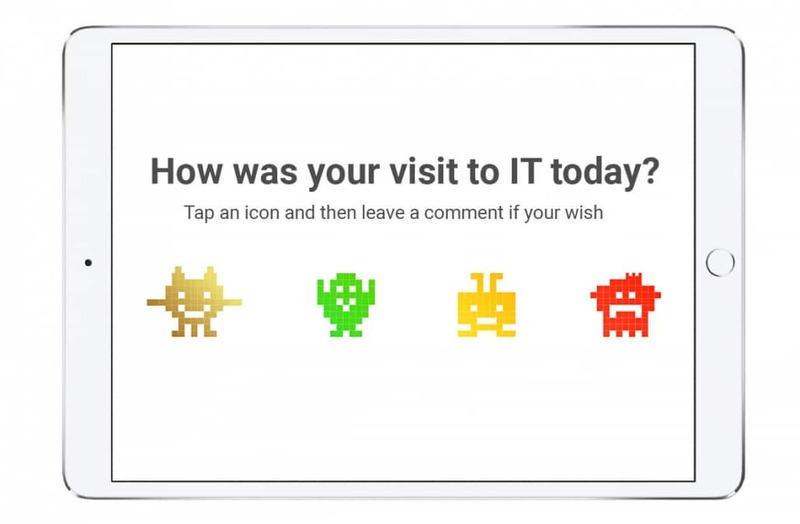 Icons make giving feedback engaging and fun. or create and use your own to fit your brand. Emojis, stars, emoticons, traffic lights, numbers, check boxes and crosses, even Hallowe’en pumpkins and seasonal icons are available from our built-in library. 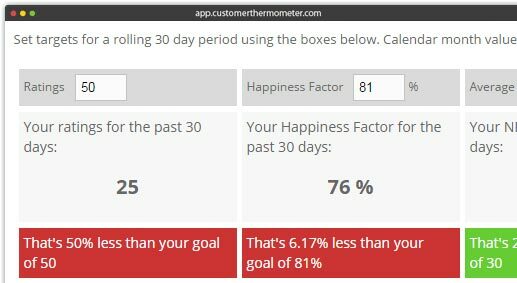 Customize your Thermometer to your style and your tone of voice. Use our numbered icons to create email polls. You can also create and upload icons you’ve designed yourself. You can also custom fields when asking for and viewing feedback – a bit like a mail merge in MS Word. You could ask how [Support agent] has been performing. 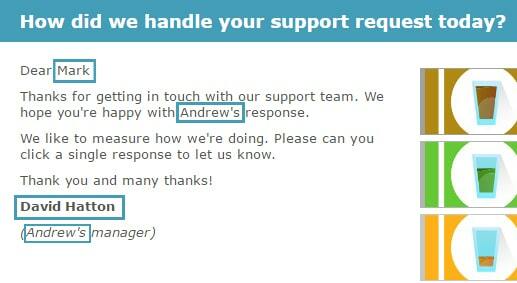 The relevant Support agent’s name is then inserted in each survey. 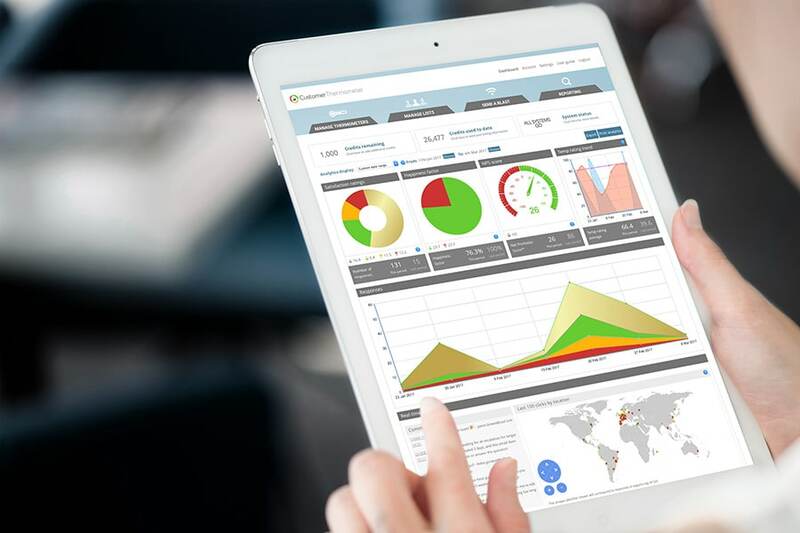 You can then see how your Agents have been performing, within your reporting. Why not send response notifications to [Support Manager email address]? The manager, associated with that agent is then notified. Our customers often want to set up a Blast for the following day or week (perhaps whilst on vacation). Simply create your Blast in the normal way, then choose the date and time you’d like it to leave. Couldn’t be simpler really. You can also remind those who haven’t responded. Send a reminder to non-respondents easily. Just click one button and sit back, while we do the rest. Measuring satisfaction by sending links to 5 minute surveys doesn’t work. When a customer clicks an icon in their email, they see one of your fully customizable Landing pages. Here’s where you can add a logo, a clickable advert, a footer, social media links and custom thank you text. Each of your four ratings pages can be different too. You can also add a prompt for customers to leave a comment which is stored inside your account and/or sent to you via alert. With many recipients responding to Thermometers on iOS / Android mobile devices, pages are responsive too. Imagine if you were a customer, had clicked a red light on a Thermometer and got a phone call from you within an hour. The issue can then be dealt with before it becomes even more serious. That’s just what we enable. 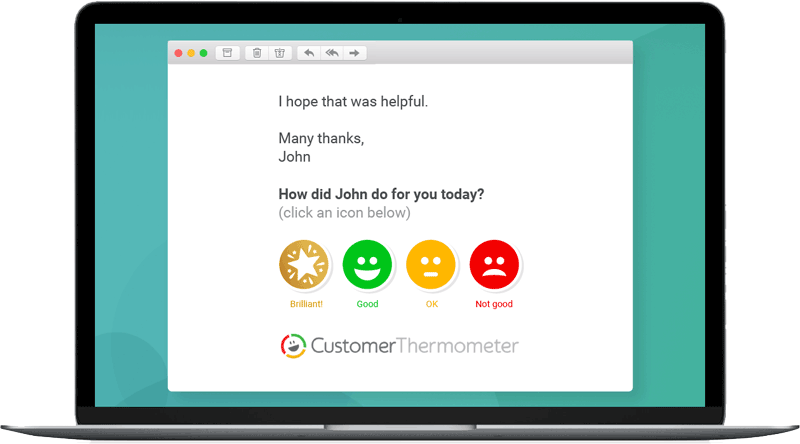 When you set up a Thermometer, you can choose to be alerted via email for any type of response. 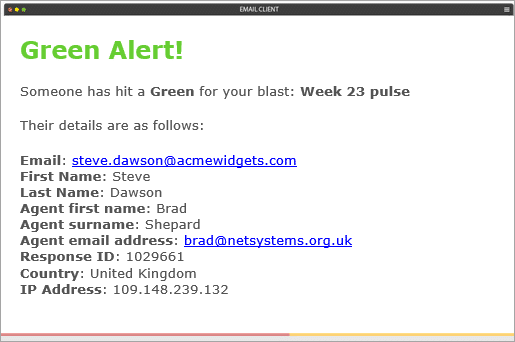 Use the power of custom fields to send that alert to the right person or people in your business. Next, it’s all about actionable, real-time insight. Let’s take a look at your reporting. 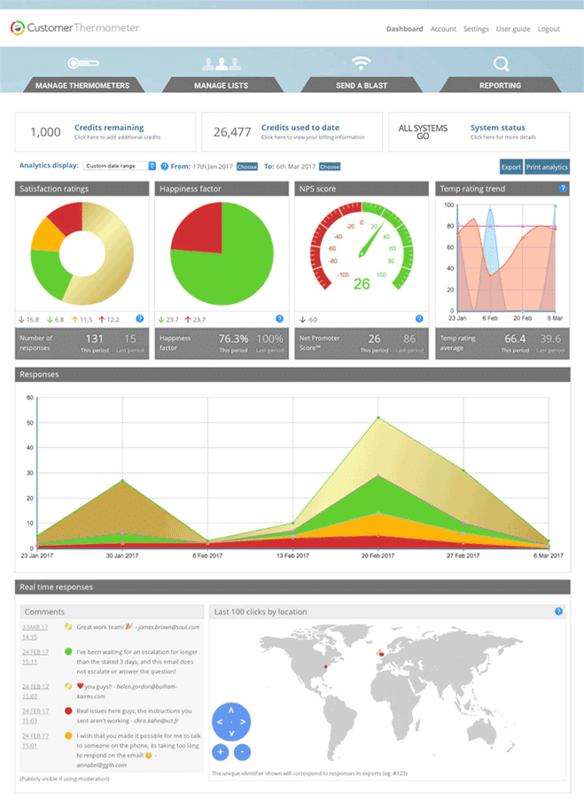 We know our customers keep their dashboards open on their desktops, to watch their responses coming in. How? Because they tell us! 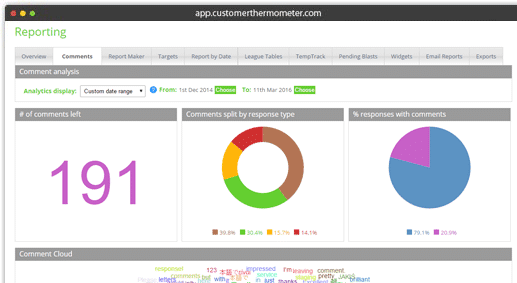 When a recipient opens an Email Thermometer or clicks a response – your dashboard will change. Send daily / weekly report snapshots by email. Export all data to CSV to analyse as you need. 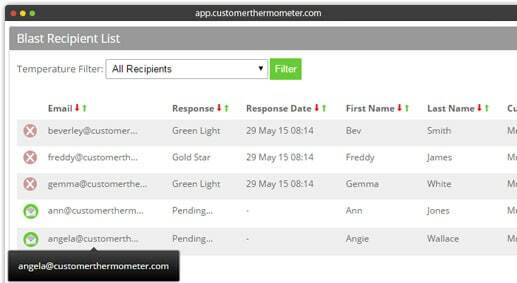 View customer responses by date range. Spot trends and compare to previous time periods. See how you’re doing in an instant and nip customer issues in the bud. 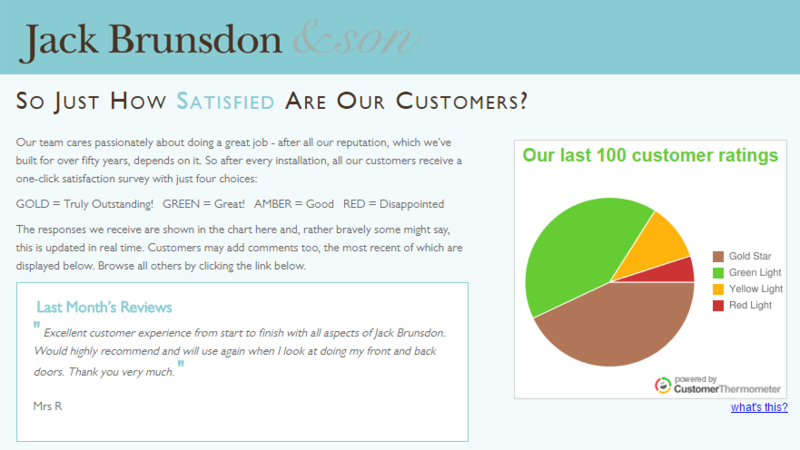 Customer Thermometer is all about identifiable feedback. If you know who is complaining or congratulating your team, you can respond accordingly. People hate giving feedback, when it appears to go into a “black hole”. We give you the tools to make someone’s day. When someone’s unhappy – contact them immediately. When someone is delighted – ask them for a testimonial or an online review. Each calendar month’s data is stored right underneath, so you can find out how you’re doing. Find out how well your staff, agents and teams are serving your internal or external customers. Use custom fields to associate your individuals, teams or departments with your customer responses. 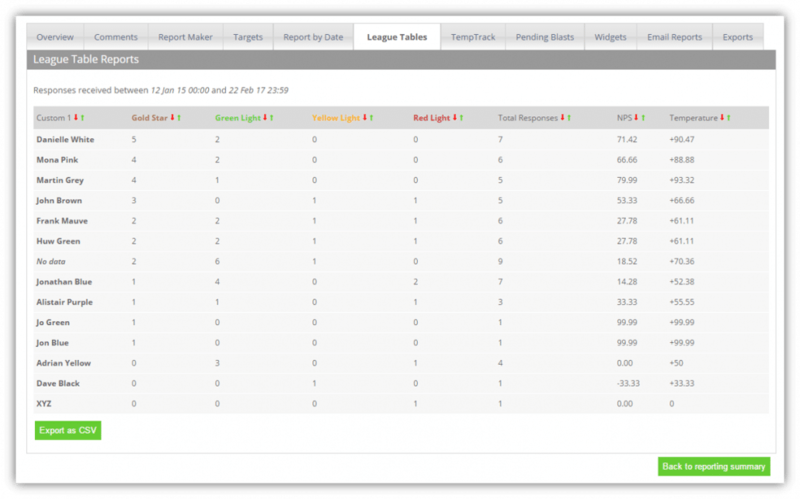 In just one click – generate league table views to create competition, train those who need help, and reward staff who are performing well. You might be surprised at what a little competition can do for your teams and your organization. When a recipient has only spent a second clicking a response, they are much more inclined to tell you more, as you’ve not mandated they answer multiple potentially irrelevent questions. This is why our qualitative comment reporting is so valuable. Once your recipient has left an optional comment after clicking a response, watch it appear in real time on your dashboards. Publish the comment to your website, tick it off to show it’s been actioned or reply directly from your email alert. 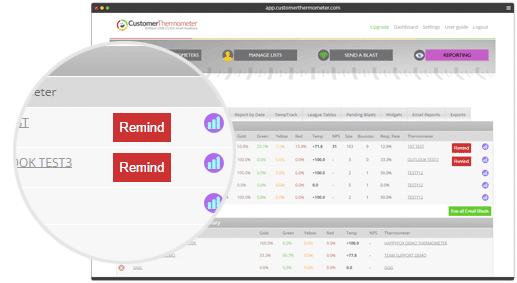 Customer Thermometer’s real time results widgets allow you to publish anonymous statistics about your survey responses on your website, internal dashboard or Facebook page. There’s a customer example on the left.